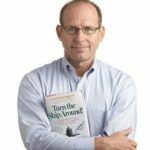 Captain L. David Marquet, author of Turn the Ship Around!, joins us in the Scrum Master Toolbox Podcast to discuss the lessons learned from his stint at the Santa Fe, a US Navy submarine that, when he took over, ranked last in retention and operational standing. How do you turn around a ship that is going south? When people leave quickly, you don’t even keep the little knowledge gathered in the team. Just like in our organizations today, the Santa Fe was losing key people and suffered from very low morale. This was the moment when Retired Captain David Marquet entered the ship. 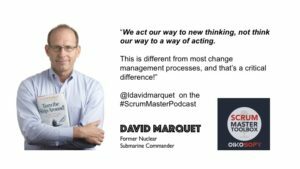 The Santa Fe was about to change, and Captain Marquet shares with us the key moments in that story as well as very practical tools you can use as a Scrum Master to help your team go from follower to leader. Leaders are expected to know a lot. In fact, in the US Navy submarine captains are put into school for 1 year before taking office in the ship. Captain Marquet shares with us the moment when he gave his first order and was made aware that his order was impossible to carry out. Many leaders do this, but are never told by their subordinates that the order is impossible to execute. This moment of understanding led Retired Captain David Marquet to start a new practice aboard the Santa Fe: being silent to allow people to express their intent. Later on the Captain and his crew developed the “I Intend to” method that is described in his Turn the Ship Around book, and enabled the major transformation in the ship: from 1 leader and 134 followers to 135 leaders on board. This simple technique can dramatically unlock the capabilities of your organization and your team. Captain Marquet also shares the simple techniques that allowed him to make the “I intend to” approach work. Listen in for the details. Leaders are leaders because they are able and willing to take control of difficult situations. And they add value by helping their teams face and resolve difficult situations. However, the challenge is that when we do take control, we immediately send the message to the team that they are not supposed to. How do we get out of that pattern? Captain Marquet shares with us his approach, an approach that he uses today with leaders all over the world. Practicing giving up control is one way we can learn to unlock the power of the organizations and teams we work with. Audience question: how to deal with bad apples? As a Captain in the Navy, Captain Marquet had to deal with all kinds of people and in situations where there was no other choice. You can’t fire a person while you are at sea for 6 months. That person can be a key to a future critical situation, so we need to make sure everyone can contribute to the challenges we face. How do you do that when there’s a “bad apple” in the team? Captain Marquet reviews with us his approach to tackling that kind of issue that we will have to face, sooner or later, in our Scrum Master career. The audience question was submitted by Alexandre Thibault, a previous guest on the podcast. George W. Bush famously proclaimed “I’m the decider!” But is that really the role of a leader? How about the role of the leader as the one responsible for the structure, the system where the teams and individuals perform their work? Captain Marquet challenges us with the idea that we, as leaders, are responsible for the system of work. The structure and methods of interaction and collaboration. While the people in the team or organization are responsible for the real work. The content of the work. If we don’t follow this simple approach we end up micromanaging outcomes as Captain Marquet says. Be authoritarian in the system of work, but decentralize decisions about the work content. The story that Captain Marquet conveys in his book is a striking example of how you can change culture in an organization, and radically improve results with simple, and sometimes counter-intuitive, lessons on leadership. Captain David Marquet (pronounced: MAR-KAY) was assigned to command the nuclear powered submarine USS Santa Fe. The Santa Fe ranked last in retention and operational standing. He literally “turned his ship around” by treating the crew as leaders, not followers, and giving control, not taking control. This revolutionary approach not only took the Santa Fe from “worst to first” in the rankings, but also created more subsequent leaders than any other submarine. Stephen R. Covey called the Santa Fe “the most empowering organization [he’d] ever seen” and wrote about Captain Marquet’s leadership practices in his book, The 8th Habit. Captain Marquet is the author of Turn the Ship Around! A True Story of Turning Followers Into Leaders. Today listed it as one of the top 12 business books of all time. David Marquet is here to share with us the powerful message that in highly effective organizations, leadership is not for the select few at the top; he will share with us how he and the crew of Santa Fe developed a way to create leaders at every level. To find out more, visit Captain Marquet’s site, buy Turn the Ship Around! You can link with Captain L. David Marquette on LinkedIn and connect with Captain L. David Marquet on Twitter. EXTRA BONUS! 🙂 Captain David Marquet’s Leadership Nudges available for you, right now and for free! You can go to youtube and subscribe to Captain Marquet’s leadership nudges. Short videos about key aspects of leadership that the shares with you every week. You can subscribe to Captain Marquet’s leadership nudges on his website, or follow the channel on youtube! Here’s one of my favourites for you to watch: 1 minute to make you a better leader!